Depression is one of the most common mental disorders in the United States, affecting around 9% of adults on average. Depression is a serious mental illness that is characterized by feelings of sadness, hopelessness, and indifference. Scientists say depression is most likely caused by a combination of genetic, environmental, and psychological factors. It is most common in women aged 40 - 59, which is most likely due to the hormonal fluctuations experienced during menopause. It is important to know how to effectively treat it. The main causes of depression are genetics, work overload, anxiety, emotional abuse, drug and alcohol abuse, and eating disorders. According to the World Health Organization, depression is considered a global epidemic, affecting around 5% of the world population. The risk of depression increases during menopause, which can be linked to hormone fluctuations experienced by women. Depression symptoms can be categorized into physical and emotional. Physical symptoms of depression can include fatigue, insomnia, changes in appetite, body aches, cramps, and headaches. Emotional symptoms are thoughts of suicide, irritability, loss of interest in favorite activities, and feelings of helplessness, self-deprecation, and worry. In addition to these treatments, it is recommended to seek professional help in order to effectively diagnose and treat depression. Talk. Talking to friends, family, or a therapist about what you are experiencing can help ease depression symptoms and allow them to better understand your condition. Keeping a strong support system is key to mental health. Exercise. Staying active and exercising regularly releases neurotransmitters like serotonin and endorphins in the brain. Exercising also promotes other health benefits like improving sleep, increasing energy, and reducing stress. Eat healthy. Maintaining a healthy and balanced diet is essential to your overall well-being. A proper diet should include protein, fruits and vegetables, complex carbohydrates, fiber, and good fats. People with depression usually have lower levels of fatty acids.Folic acid (vitamin B9) - found in spinach and avocado - is also beneficial for easing menopausal symptoms. De-stress. Stress weakens the body and makes you more susceptible to pain and depression. It is vital to try to reduce stress as much as possible for your overall health. Yoga and meditation are great ways to relieve stress. Reading and listening to music can also be helpful in relieving stress. Depression is a serious mental illness that should be treated. Unlike fleeting sad moods, depression is a constant psychological state that can considerably interfere with daily life. Women are more likely to develop depression during menopause because of hormone fluctuations, which can be directly linked to mood changes. Physical symptoms of depression - like headaches and body aches - can be very painful. Exercising, eating healthy, and reducing stress are all beneficial ways to help overcome pain and depression. 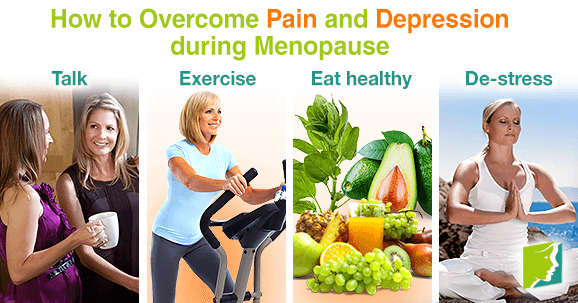 Click on the following link for reading about approaches to deal with depression during menopause. Learn about depression after menopause here, from causes and treatments to much more, so that you can sail into your twilight years on a happy note.